What are some strange things that really shouldn’t be acceptable in society? Driving slowly and not being in the far right lane. I recently read the top two complains drivers have are tailgaters, and people who drive to slow. ALL OF THIS CAN BE FIXED, America. We have a lane system, use it. I don’t care if you are the only one on the road in a post apocalyptic road warrior type world… if you aren’t passing, stay to the right. What would be the most disappointing thing to win a lifetime supply of? What’s a name that makes you automatically assume something about someone? Well, that would be giving away all my prejudices. Just assume I am thinking about you, and judging you from afar. What celebrity probably reeks the worst? Johnny Depp. Speaking of him, I am thrilled to see him acting again. He took, like, 15 years off to get rich in the Caribbean… who can blame him. This Whitey Bulger movie looks SO good I can’t wait to see it. Oscar bait, for sure. 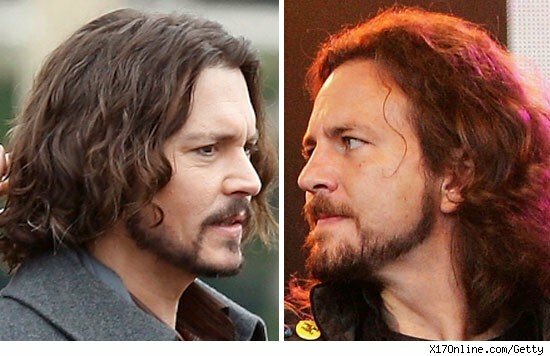 Plus, I think he and Eddie Vedder have finally just merged. This, for example, is not photoshopped. We can only assume this was taken just seconds before the final deed was done. What’s the best thing you’ve made drunk? Actually, I regard myself as one of America’s top drunk cooks. I can raid your fridge at 2 am and make something we will all love. Ask anyone who can remember. Mostly, those days are behind me. Can’t handle the hangovers anymore. Plus, I don’t sleep well drunk. I tend to lay in bed for 2 hours fitfully trying to sleep and my body isn’t having it. I can prove it! I have ten gallons of homebrew on tap in my kegerator, and I haven’t touched it in months! It’s mostly for guests, and emergency preparedness. Johnny Depp/Black Mass… Couldn’t they have just saved a lot of time and money… And just hired Ray Liotta to play the part?